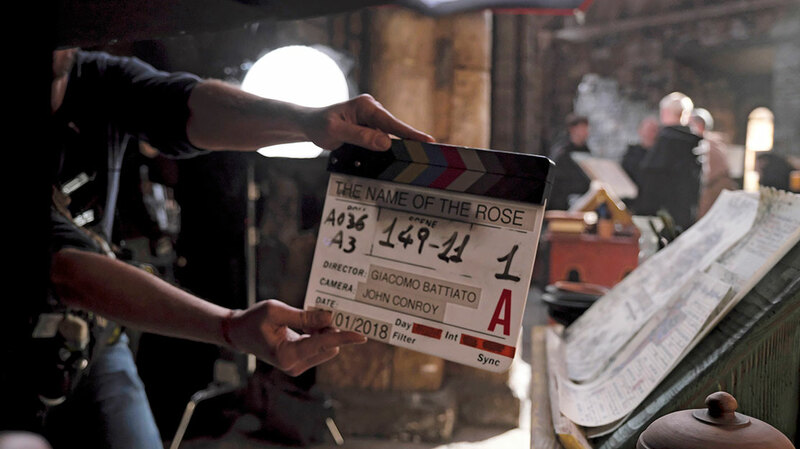 DQ heads to the legendary Cinecittà Studios in Rome to see filming for Middle Ages drama The Name of the Rose, based on Umberto Eco’s bestselling novel. Inside the broad stone walls of the monastery, the air is thick with fog. Monks wearing brown habits and sporting tonsure haircuts walk briskly across the snow-covered courtyard to avoid the path of five oncoming papal guards, dressed in chain mail and dazzling yellow tunics. Around the perimeter are various buildings and outhouses – a blood-stained butchery, a glassmaker’s shop, a small graveyard and a balneae filled with barrel-shaped bathtubs. Rising above them, however, are the intricately detailed entrances to the church, which faces the monastery’s imposing wooden entrance gate, and an octagon-shaped tower that will eventually rise eight stories into the air with the help of the numerous green screens that have been lifted into place around the backlot of Rome’s legendary Cinecittà Studios. It’s here that filming is underway for The Name of the Rose, an English-language adaptation of Italian writer Umberto Eco’s bestselling novel. Some 38 years after the book’s publication – and 32 years since a film adaptation starring Sean Connery and Christian Slater – Italian producers 11 Marzo Film and Palomar have partnered with Tele Munchën Group and broadcaster Rai for an eight-hour event series starring John Turturro (The Night Of), Damian Hardung (Red Band Society) and Rupert Everett (My Best Friend’s Wedding). It is due to debut next spring. Set in Italy in 1327, the story follows Franciscan monk William of Baskerville (Turturro) and his apprentice Adso of Melk (Hardung) as they arrive at a secluded monastery in the Alps, where they witness a series of murders. While Baskerville and Adso are investigating and searching for the killer, the Pope orders merciless inquisitor Bernard Gui (Everett) to destroy the Order of St Francis – with Baskerville on his list. The ensemble cast also includes Michael Emerson, Sebastian Koch, James Cosmo, Richard Sammel, Fabrizio Bentivoglio, Greta Scarano, Stefano Fresi, Tcheky Karyo and Piotr Adamczyk. Across a 20-week shooting schedule that began in January and was delayed by severe snowstorms at the beginning of March, the €26m (US$32m) production will film in Rome for the interior of the church and the cloisters, as well as scenes set in forests, woodland and fields. The Abruzzo region to the east of the capital will be used to create the mountainous backdrop of the monastery’s isolated location, while Perugia, further north, will double for scenes set in Florence. 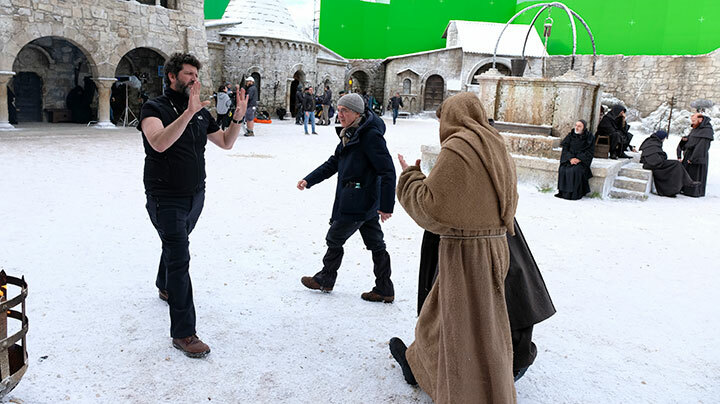 It’s here at Cinecittà, though, that the bulk of production is taking place, both on the backlot and in a number of its cavernous, terracotta-coloured sound stages that have been used to recreate the look and feel of life in the Middle Ages to hugely impressive effect. 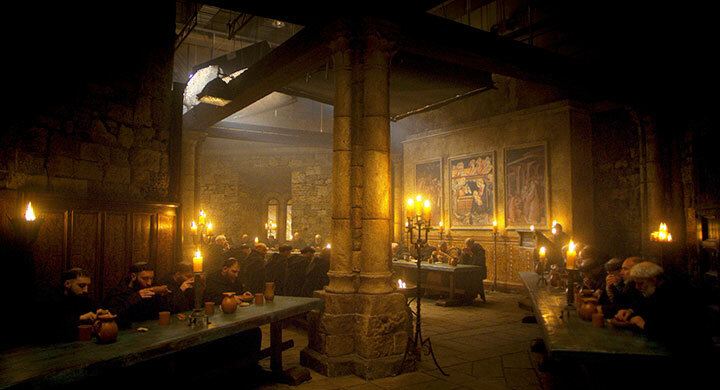 The production team have built a refectory, chapter hall and a working paper mill that, in the story, supplies monks with the paper they need to write the books that fill the labyrinthine library, which is spread across dozens of rooms on the highest six floors of the monastery’s tower. Battiato polished scripts first written by Porporati and then Williams, and says he was drawn to the numerous elements that make up Eco’s story and go far beyond the novel’s thriller premise. In particular, he points to the father-son relationship between William and Adso, which has been fleshed out to greater effect than in the novel or the 1986 film. The same goes for Adso’s relationship with a peasant girl (played by Antonia Nina Fotaras), a secret love story that leads him to question whether to follow his faith or his heart. Then there is the religious element, with the Franciscan monks’ life of poverty set in contrast with the wealth of the Papacy. Il Nome della Rosa, as it is known in Italian, boasts a creative team that includes DOP John Conroy, executive producer Patrizia Massa and costume designer Maurizio Millenotti. The walls inside production designer Francesco Frigeri’s office are covered with stunning design sketches that show the monastery atop a snow-covered mountain, completely cut off from the world. The tower is immediately eye-catching. 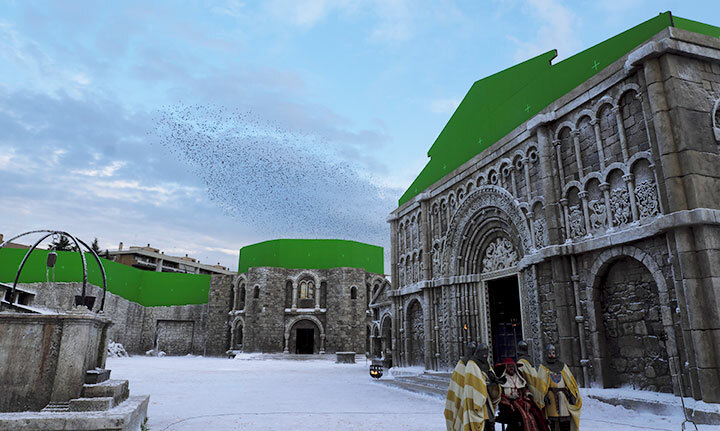 Around 300 people have been employed across the design elements of the series, with four construction managers overseeing the set builds alone. A further 180 people have been on set each day. Kloiber describes a two-year chase to sell the series, the footnote to a long development process spearheaded by 11 Marzo. Once on board, however, TMG was happy to sit back and let the other partners drive the project forward, not wanting to muddy the creative waters. Rai is building a slate of international-facing dramas that appeal to audiences both at home and abroad, with fellow period Medici: Masters of Florence, which launched in 2016, having sold to broadcasters around the world. “Italy has a cultural heritage made up of centuries of history and experiences of universal value,” says Rai Fiction director Eleonora Andreatta. “Rai’s fiction has shown it can be an open window to the world, capable of transforming the heritage of our culture and our literature into stories of great modernity that are also able to speak to a global audience.